They caught 6 blue marlin on conventional yesterday and 6 blue marlin on conventional today, plus 3 sails and an epic battle with a giant yellowfin tuna, then pulling the hook. 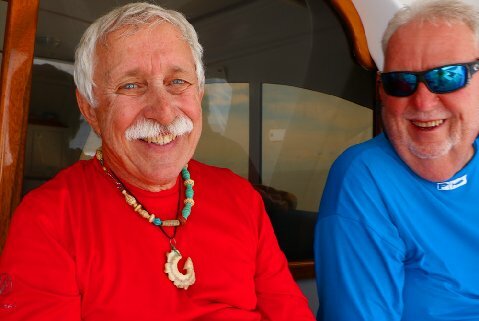 June, 14, 2016: Marty and Martin Arostegui and I boarder the vessel “Dragin Fly” at 2:30 PM, at the Los Suenos Marina. Captain James Smith with mates Berto, and Roberto, cast off and we pulled out of the marina and headed south, out to sea. We ran for an hour at 24 knots, then slowed to trolling speed and deployed our teasers, and prepared our fly tackle for whatever came up on the teasers. Trolled til dark with no fish raised. After dark we had dinner, washed up and went to bed, while the Dragin Fly continued steaming on to ”Blue Marlin Destination – X-1” (BM-X-1). June 15, 2016: We woke up at 4:30 AM with another 2 hours to get to BM-X-1, so we ate breakfast, cleaned up, and deployed our teasers. At 7:34 AM we raised a nice 150 pound Blue Marlin, teased it in, Marty cast the fly, and the fish tried to eat the fly. That Marlin pulled 3 foot of line off of the reel, then dropped the fly and was gone. About 30 minutes later we raised another blue marlin, but it would not tease in for a bite. At 9:30 am, Captain James decided to make a move to another location about 24 miles away, this location is known as BM-X-2. About half way there we came across two other boats who were fishing on a piece of floating debris, we fished that for an hour, raised one fish and got no bite. When we got to BM-X-2 we raised 3 more Blue Marlin before 2:00 PM, the first was a 250+ pound fish which Marty cast to, it ate the fly, ran 60 feet and stopped, then took off deep in high gear, the drag on Marty’s reel had a cork drag, it increased the pressure as the fish spun the spool faster than it had ever spun before, and broke the 20 pound class tippet. 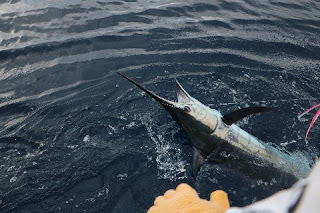 Now we switched to my Mako Fly Reel and TFO fly rod, however the next two blue marlin which we raised, did not tease in. Between 2:00 PM and dark we saw one Striped Marlin on the surface, it was not interested in eating. At 7:00 PM we ate dinner, took showers, and went to sleep after deploying our sea anchor, we are about 160 miles from Los Suenos out in the Pacific Ocean, in dead calm conditions. June 16, 2016: Woke up at 4:00 AM, drank 3 cups of awesome Costa Rican coffee, ate breakfast, then pulled in the sea anchor, deployed teasers, and began Blue Marlin fly fishing. At 6:00 AM we raised a 120 pound Blue Marlin, Marty Arostegui made a great presentation at 6:04 AM, using my TFO BW-HD fly rod, Mako #9700 fly reel, RIO Leviathan Fly Line, a Pink and White CS fly, with 20 pound Mason Hard, class tippet and Gamakatsu 7/0 octopus hooks, and that Blue Marlin ate that fly perfectly. Marty caught that fish, I wired it for pictures, and we released Marty’s first ever Pacific Blue Marlin caught on fly at 6:37 AM. Congratulations to Marty! At 6:51, we raised another small Blue Marlin, Martini made a great cast, the fish came out of the water to eat that fly, that marlin missed the fly completely, and was gone. At 7:45 AM we raised another nice sized Blue Marlin, it did not tease in for a bite (3 Blue Marlin raised before 8:00 AM). At 8:35 AM we raised a 90 pound sailfish, Martini hooked that fish and fought it for 12 minutes before we wired it, took the fly out and released that beautiful sailfish on fly. Looked like the fishing was just getting hot. A hundred miles offshore is a long ways and there is no way to get there but slow, especially if you are planning to stay there a while. The Dragin Fly burns 32 gallons per hour when cruising 24 knots or 2 gallons per hour when chugging at 8 knots. The best way to maximize your time on location and at the best fishing times is to depart the afternoon before, chugging to the spot overnight and arriving in time for the morning bite which usually occurs while others are running to destination. During the Costa Rica Green Season, May through November, the prevailing winds are onshore, squeezing moisture out of the atmosphere on to the lush green mountains that in April were brown with drought. Showers are almost daily, but plenty of sunshine is usually mixed in, at least part of the day looking like the dryer months of winter. The same is true offshore, high clouds and lines of showers will blow through leaving calm winds and clear skies ahead of the next batch. These offshore showers will puff up a little wind and blow, but not long enough or hard enough to create a big swell. It can get a little choppy, then slick out for other parts of the day. This afternoon there was some chop on that swell which was aggravated as it collided with the rocky cliffs on the island shielding Los Suenos in Herradura Bay. It was pretty mixed up so we decided to run an hour offshore and get to calmer seas before putting some lines out and starting the long chug. With a couple hours of daylight left and reports from boats returning from day charters hopes were high of running into a school of spinner dolphins and tuna, packing away some fresh fish for the trip. Our spread was set up for trolling faster than we would normally troll for sailfish. We were trying to cover some ground but also wanted to have a shot at any fish we ran over in the process. From the bridge James has one teaser reel above his head which has line going out of each side, guided by rings and pulleys to halfway up the outrigger. These teasers are large, soft, hookless lures that chug on the surface and are meant to trick the fish into showing himself so anglers can “pitch” the appropriate bait and rod for the size of the fish. James’ teasers are trolled closest to the boat, usually about 30-50 feet back and yield the most exciting bites that no one can miss. By turning the handle on the disk above his head, James can adjust the distance or crank them completely out of the water. He can also grab the line from one side or the other and manually pull a teaser away from a hungry fish so that a bait can be presented. Behind James’ teasers are two Laceration lures, usually very similar to our teasers, slightly smaller, but with hooks, attached to Shimano 50 Trynos reels. These lures are run further up the outriggers, keeping them “outside” and behind the short teasers. 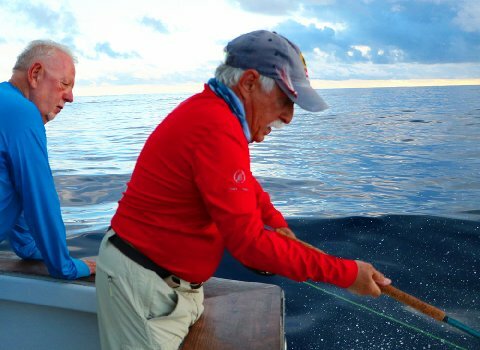 In a normal sailfish spread, the lures would be replaced with additional hookless teasers, automatically retrieved via electric reels at the push of a button. Behind each of the four teasers are swimming ballyhoo with a hook and a fifth ballyhoo as a “shotgun” to clean up any misses that a fish may leave behind. Trolling faster than normal and trying to catch up with a school of tuna on the horizon, we only had 3 ballyhoo deployed, one behind each lure and the shotgun being pulled from the bridge. It was that rod that got all the action. High flying frigget birds picked up on radar gave away the school. As we approach the spinners can now be seen making big splashes as they leap in the air, each time spinning at least a full 360 degrees or more before crashing down. For every spinner dolphin in the air there are a hundred more marching forward. Ahead of the spinners are the tunas, chasing down flying fish unfortunate enough to be in the path of this hungry procession. Baitfish from hundreds of feet below are attacked, balled together and pushed to the surface in a panic. They are then attacked from all sides and now from above. Dozens of booby birds dive from 100 feet, penetrating the surface and the momentum carrying them down to the bait ball which may still be 100 feet below. The smaller “sailfish” birds fly low to the water, quickly stopping and sticking their head below the surface, taking a peak. They flap wings and kick webbed feet on the surface to gain another few yards on the fleeing school of baitfish then they dive and paddle down for their meal. Built for flying, the “tijereta” has a forked tail resembling a scissor, hence it’s Spanish name. The long, sharp wings and tail are meant for soaring but also for speed. When the bait ball finally makes it to the water’s surface, the most graceful of them all dive bombs at break neck speed from the heights of a sky scraper, suddenly stopping just above the surface and plucking a baitfish from the ball with it’s hooked beak. The figget birds may follow this school of spinner dolphins for days, sleeping on auto pilot and never touching it’s feathers to water, for if he does, he may not make it airborne again. Splashes of all shapes and sizes, birds, bonito, dolphins and the tell tale busts of tuna splashes. The bigger the bait ball, the longer it lasts, but the end result is the same. A school of tens of thousands, perhaps millions of individual baitfish are devoured. Gone. The only sign of the carnage when we pass over the killing-grounds is a cloud of scales that look like snowflakes peacefully falling, drifting, falling for days maybe weeks before resting on the bottom. This school of dolphins have the tunas with them, now only a half mile ahead we can see an acre of yellowfins up to 100 pounds airing our and running down flyers. Time to get those ballyhoo out of the spread and put something out more suitable. I’m up on the bridge with James and pick up his bridge pole. I start cranking really fast and the ballyhoo skips out of the water, behind it a huge explosion, probably a tuna, so I stop cranking, waiting for another bite. 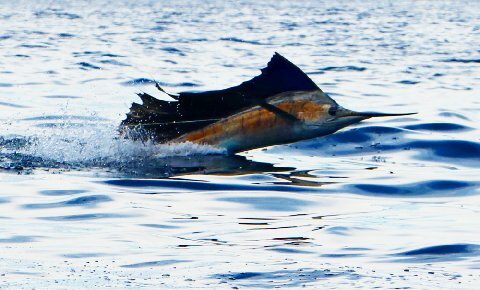 The dorsal fin of a blue marlin then pops up behind my ballyhoo and fades off, I drop it back a little then quickly raise the rod bringing the bait again to the surface and making a little splash. That’s all it took, the marlin now with shoulders out of the water and mouth open, down the hatch. Brad and Mike had blue marlin on their bucket list, neither one of them had caught a Pacific billfish. The hope was for each of them to release a blue marlin on their two full day, three night seamount trip. Brad released his first blue marlin before we got started, only a couple hours after leaving the dock, giving us a preview of what was to come. After putting them back out, Mike releases his first sailfish. We never did catch up with that school of tuna before the sky darkened and the show ended. Spaghetti dinner and 80 miles to go, should be there about daylight. I’ve heard people ask if they could go look for blue marlin. Best response I heard was : “Son, you don’t go looking for blue marlin, they find you.” They happen when you least expect it and it’s nothing that you can expect. You can troll the best marlin fishing grounds in the world and be happy to get a bite or two a day. That’s good fishing. To get multiple shots at blue marlin in a day is epic. What we were about to get on day 1 had us looking at each other and pinching ourselves. Was this really happening? Please don’t wake me up. Daylight arrival on the first spot and there is nothing to it. We have a few bonito, the preferred pitch baits, but not enough of them that we can keep one skipping in the spread. We’ve got out James’ teasers out, one lure on each side and one down the middle. Bacon, eggs and a half dozen circles around the spot and we are again on the prowl, chugging to another pinnacle a couple miles away that will hopefully be more productive. 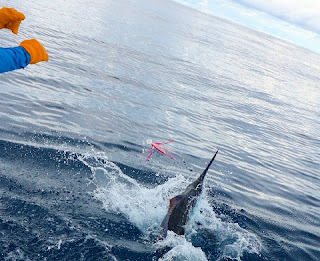 When we get close to the spot bonito start splashing in front of our lures and teasers trying to eat the metal swivels. We put out some spoons and quickly gather up a half dozen baits. We will use these fresh baits to pitch to marlin coming up on the short teasers and one will skip down the middle, replacing the third lure that we had out. Back on the troll and it doesn’t take long before the right clip pops out, the reel pulls a little drag, then it’s gone, but there is now a marlin behind the right teaser when the left lure pops out the clip and we are hooked up. Was that 2 blue marlin in the spread at one time? Could it possibly have been 3? No way. That had to have been the same fish. Mike’s fish is screeming line off of the Tyrnos, down to a quarter spool before she jumps and throws the hook. We wind in all that line and put ‘em back out. As we are running the right lure up the rigger a marlin grabs it and we’ve got him on. It charges away then races towards us. Line is peeling off the reel, the rod is pointed where the lure disappeared behind the boat even though the marlin is now beside us and about to out run the boat. The engines belch puffs of carbon and we are now almost on plane trying to outrun this marlin that is now mostly airborne, only touching the water long enough to launch itself forward. We finally get in front of our fish and the huge belly of line comes easy. “Reel, reel, reel, keep it tight!” It got a little too tight after some loose line wrapped around the tip and our marlin was gone. Zing. Pow. Maybe that was two marlin back there? Put ‘em back out. Two minutes later. Left teaser gets slammed and out goes a pitch bait on one of two brand new Shimano Talica 50’s that we were hoping to test out. They both got their try as a 2nd blue marlin now appears on the right short teaser, eats the pitch bait and is hooked up. We are hooked up to a double header blue marlin and end up releasing both of them. Somebody please pinch me. The flurry faded just long enough for us to go through it in our head. Did you see that? Can you believe how high that fish jumped? We catch one on a Laceration Lures Fishina and put it back out only for it to immediately being eaten again. This fish is getting stretched out so instead of backing down we turn towards the fish to run her down. Roberto sees a marlin feeding on the surface about 100 yards away. I decide to pitch out a bonito and let it skip on the surface as we run down Brad’s 2nd marlin of the morning. The bonito is in the water and the leader is just out of the rod tip. It hasn’t moved yet, just slowly sinking as James faces the fish and prepares to put the Dragin fly in Gear. Thirty feet of line is out of the rod tip and a blue marlin with pecs lit up like light savors comes from under my feet and eats my bait. We are now hooked up to our 2nd double header blue marlin and end up catching 5 for 8 by 8 in the morning. Several other larger private boats who left early in the morning are now just arriving after their 4 hour run. We got the best of it, landing 2 more blues on live bait and deciding at mid day to load up on bait and start chugging to a new location. Just before dark, the eastern line between sea and sky can still be seen but the westward horizon is beginning to blur into the clouds of another passing storm. The lures are only occasionally visible and we have never had any bites while trolling after dark, so it’s time to bring them in when the left teaser explodes. A couple of circles but the fish never returned. This seems like a good place to put out the sea anchor and spend the night, within several miles of the spot we want to fish in the morning. As soon as the sea anchor catches there is bait and life of all kinds all around us. First a few squid which are quickly run away by waves of baby yellowfin tunas which fade down under the carpet of tiny triggerfish, triple tails, blue runners and jacks of all kinds. The squid are expected, the bonito often, but all the other life is usually only around floating structure, a log or floating FAD. In the vastness of the Pacific, a barely floating 55 gallon drum can be its own ecosystem. At first light bait is quickly made and we’re on the troll before the eastern canvas is painted. We’ve got a marlin on the right short but it fades away, couple of circles and we continue our journey but not before putting a mark on the chart “DD” for those two marlin raised at dusk then dawn. The Imperial FAD is about 3 miles away and we chug towards the X marking where it used to be anchored. There is nothing there, several circles around the bank, no bait and no fish and James is convinced we need to move on, but not before passing by “DD” one more time. Approaching the numbers I glance at the sonar and sea that we just “ran over one” and tell James right before the left lure pops the clip and we are connected, staying connected for our first release of the day, right on the numbers. There has got to be something there. 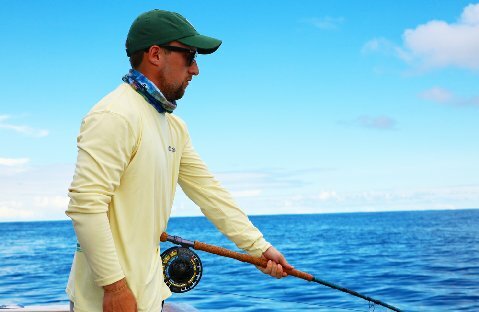 Circles and circles and we mark nothing even though bonito are plentiful, occasionally airing out on the swivels in front of the lures. By now we’ve got the two teasers, two lures and two skipping bonito, one of which has a blue marlin dorsal fin and bow wave behind it. Dropped back, inhaled, one potato, two potato, three, locked up and we are again connected. What the heck is holding this life here? After the release, circles are widened in search of the phantom floating object but we never find anything. Early in our search we did raise five more marlin, in the same general area, but the bait disappeared and everything slowed. With that many fish in the area and Mike and Brad having “made their trip”, each with two more marlin releases under their belt for the morning, it was time for me to try the fly. Hooks are removed from the spread and three teasers are left out, but the bite had died. Abandoning our search for whatever was holding all that life through the night and those marlin in the morning I am fatigued out on the couch, in a deep swaying sleep. Four miles later I am still oblivious to my surroundings or the blue marlin chewing on the middle teaser. I beat the fish to the transom and get the fly is in the water and loaded for the cast which is made as the propellers stop, the teaser is snatched from the fish and all the whitewater disappears so you can see it happen only 30 feet away. The marlin’s tail is lit up but he passes by the fly without consideration, fades to black and starts to swim away. Quickly Berto casts a hookless chugger with a dolphin belly strip past the marlin and furiously retrieves it towards the boat over the marlin’s head swimming deeper and in the opposite direction. In the smallest fraction of measurable time a switch is flipped and the speed and power of a blue marlin is unleashed. The tail and pecs again light up to neon blue. The fish that was 8 or 10 feet down, slowly swimming away is now the air, facing the opposite direction and has eaten Berto’s hookless teaser, all this within a body length. It happened instantly. And at that instance everyone knew why we were trying to catch them on the fly. I turn around to take in everyone’s stunned reaction and I see the FAD around which James was making his first circle. This was not an intentional FAD or Fish Attracting Device, but it was definitely attracting fish. Our spoils are the result of some unfortunate long liner whose lost gear has been balled into a twisted knot of buoys, jugs, poles with flags and monofilament. Probably caught I the props of a freighter and dragged miles away before twisting free of the props and set adrift. From every strand of this hanging mass grows algae and to which crustaceans cling. Dozens of species of fish in all parts of their life cycle are using this as shelter and a feeding station, including the blue marlin that recently refused my fly. It wasn’t long before I had another chance and another refusal. Mike and Brad were very generous in letting me take my shots. We raised 10 blue marlin to the fly, I made a horrible cast that went into the riggers on one. I unintentionally took the fly away from another. I had a hot marlin that crashed the fly once but somehow missed the hooks and my fly calmly sitting in a hole of water once occupied by a half airborne blue marlin. I got one really, really good bite, hooked up, ran out about 100 yards, jumped and threw my fly. With an approaching squall line and rain, we decided to put some meat back in the water. This time no lures, just James’ two teasers and each of us holding a skipping bonito. After seeing it happen that close to the boat, now everyone wanted to feel it happen and we all got our chance, each of us landing a blue marlin before dark from several bites. For the day, we landed 7 blue marlin from 23 raised to the back of the boat. Add 3 of 4 sailfish that we caught in our travels to the 4 marlin that we raised on the way home, our two and a half day total was 14 blue marlin releases from 31 raised fish on conventional and another 10 raised on the fly.